PLAKART in partnership with City Museum announces the launch of the First International Student Poster Competition, Skopje 2008 as opened.The project was supported by the Warsaw Poster Biennale and several external associates – professors from Europe, Israel and Turkey. The “Tolerance – A Global Challenge” project embodies a number of activities which are meant to contribute to a graduate improving of the society as a whole, giving special attention to the young population between the age of 18 and 28. 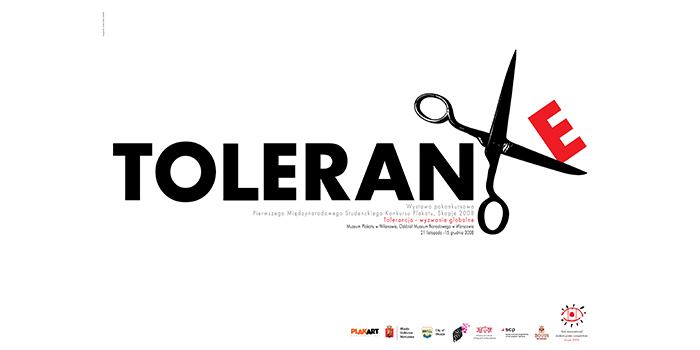 Its goal is to bring the ideas together, giving the youth a chance to express their beliefs and thoughts through “Tolerance – A Global Challenge” by creating a ‘poster’. It will have a direct effect on the society by opening new horizons and giving a strong motivation for the youth to work towards a better future. This project should promote the ‘poster’ as a mean of expressing these ideas among the European youth. A healthy society must serve and satisfy at least the basic needs of the population and to offer various opportunities and alternative choices. It is widely recognized that the artistic approach offers greater potential than the political when delivering a specific message. Therefore one of the goals of this project is to merge the European students in the territory of the Republic of Macedonia. A country that was once proclaimed an “Oasis of Peace”, but latter hit by an ethnic conflict. A country that could be a good example of tolerance against lack of acceptance. A perfect place to spread the idea of global TOLERANCE. Generally, the discrimination and fight against it is an issue which is facing all countries in the world, including Macedonia. The problem is to identify the discrimination, especially if it is not a direct one. It is coming from the lack of definition which is personal and material scope of discrimination and also the grounds for it. The organizer of this competition will continue promoting young artist and their posters around the globe, creating traveling exhibitions in Europe and Asia. One of the goals of this project is to merge the students from world academies and Europe in the territory of the Republic of Macedonia. “Tolerance A Global Challenge” represents a base of cultural interchange, having made new friendships, realizing the importance of tolerance as its major goals. Through the defining of the ideas based on tolerance the young spirit should understand its value and realize the common advantages that this concept offers, building a solid grounds for further promotion of tolerance on global grounds.